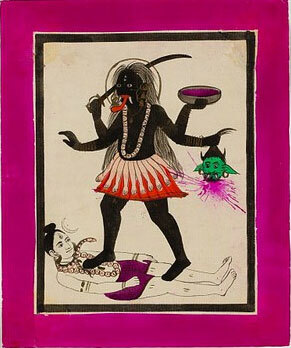 Four-armed Kali is dancing on the prostrate Shiva (her consort) as a tantric symbol of regeneration. She is depicted with long ragged locks, fang-like teeth, lips smeared with blood, tongue protruding, bare breasts, with a third eye. She holds a severed head in one of her hands and a large sword in another. Kali is the malignant aspect of the goddess Sakti (also known as Durga). The conflict of her personality follows the widely held notion that out of destruction comes rebirth.